“It’s not always what the team can do for you, it’s what you can do for the team.” Taylor Moret takes those words to heart and believes that supporting the growth of others is just as important for the community as supporting her growth. In her role as Marketing Coordinator at Society Insurance, Moret has helped to elevate the organization’s marketing efforts through creative product launches, creation of logos for Society’s Best trips, playing a vital role in Society’s community involvement sponsorships and serving on Society’s United Way committee. She has also begun working on her Certified Insurance Service Representative (CISR) designation and was selected to participate in Society’s College of Insurance. In addition to her robust professional involvement, Moret also serves on the advisory council for the Fond du Lac Marketing Professionals, marketing committee for Fond du Lac Area Women’s Fund, Fondy Bunch Kiwanis Club in which she serves as vice president, and planning committee for NAMIC Communications and Marketing. 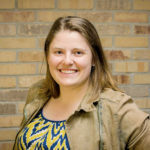 She is an active member of YPF, Fond du Lac YMCA Corporate Challenge, Wisconsin High School Forensics Association, Fond du Lac Area Lemonade Day, Crawford County Fair, Janssen Elementary PTO and Ladies Wine & Design Fond du Lac.